NASA/Swift/Aurore Simonnet, Sonoma State U. Almost four billion light years away, a supermassive black hole named Swift J1644+57 is hibernating. Like almost 90% of the biggest black holes in the universe, Swift J1644+57 is dormant, which means it’s not actively looking for matter to gobble up into its nearly bottomless pit of gravity. And, therefore, it’s especially black — it’s not radiating light or anything else for that matter. But sometimes, while a black hole is hibernating, a meal just happens to fall into its lap. A wandering star ventures too close to the black hole’s gravitational reach and spirals hopelessly towards it. “The ensuing feeding frenzy, known as a tidal disruption event, sets off spectacular fireworks,” a University of Maryland press release writes. For the first time, astronomers at the University of Maryland and the University of Michigan have caught X-ray echoes from one of these tidal disruption events — an unfortunate star succumbing to Swift J1644+57’s gravitational pull. The results are published in the June 22, 2016 advance online edition of the journal Nature. Before matter falls into a black hole, it spirals closer and closer to the event horizon (where the black hole’s gravity becomes inescapable). It forms a “giant, puffy cloud of shredded star stuff waiting for its turn to be swallowed up” called an accretion disk. 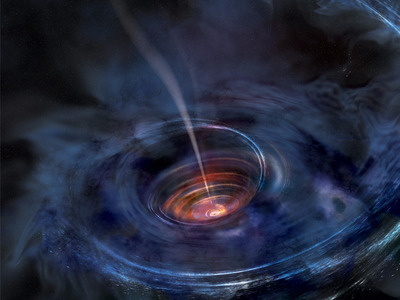 As the matter falls in, X-rays bounce around “deep within the walls of the black hole’s newly formed accretion disk,” the press release writes. Using these X-rays, scientists were able to figure out the shape and activity of the Swift J1644+57’s accretion disk. Astronomers have long thought that high-energy X-rays were created further from the black hole in relativistic jets, where the black hole spits out enormous beams of particle at almost the speed of light. This is the first evidence that X-rays can be born much closer to the black hole in the heart of an accretion disk, where they are then reflected, amplified, and focused like a flashlight, the press release writes. By measuring short delays in the amount of time it takes these X-ray signals to arrive here on Earth, scientists can actually map out the inside of an accretion disk. And getting a clearer picture of the accretion disk can give them more information about the speed and direction that the black hole is spinning. Supermassive black holes are gigantic beasts — they can be millions of times more massive than our own sun. Until now, scientists have had to rely on active supermassive black holes devouring matter to learn more about them. But these active black holes are rare, making up only about 10% of the population. In order to fully understand these supermassive black holes, scientists need to be able to study the dormant ones. One intriguing thing about the way Swift J1644+57 ate up this star was how quickly it did it. The event violated the “maximum speed limit” at which black holes consume matter. This finding can help astronomers understand how supermassive black holes grow to their enormous masses, the press release says.